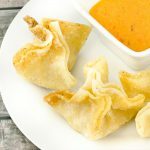 A fabulously fried wonton with shrimp and cream cheese filling. In a large cast iron skillet, fill with oil a couple inches high. Preheat the frying oil on medium heat for about 10 minutes. While the frying oil is preheating, in a separate pan add the olive oil and lightly cook the shrimp, minced garlic, and salt on medium heat. Once the shrimp turns pink it’s done (3-5 minutes). Remove from heat, and set aside. In a mixing bowl, combine the softened cream cheese, Worcestershire sauce, soy sauce, garlic powder, onion powder, green onions, and sesame oil. Mix until smooth and creamy. Add in the shrimp to the cream cheese, and lightly mix another few seconds. Lay a wonton wrapper on a flat surface. Place half a tablespoon of the cream cheese filling in the middle of the wrapper and fold the corners together making a triangle. Bring the other two corners together forming a "flower". Repeat the process until all wrappers are filled and folded. Fry the rangoons in the preheated oil for 2-5 minutes or until the wonton wrapper is lightly golden brown. Serve with teriyaki sauce, bang bang sauce, or sweet chili sauce.